Coulsons Boeing 737 is being used, & Air Tractors sucking up water from Lake Pedder. Overlandman wrote: ABC news tonight reported that fire crews are setting up sprinkler systems in the Mt Anne / Pandani shelf area. I am glad they are doing what they can to save the wondrous Pandani Shelf and Mt Anne area. I wonder where they are getting the water from. Perhaps that body of water just below the main few shelfs. It is perhaps some small consolation to the many that mourn the drowning of the real Lake Pedder that the vast waters of the Lake Pedder impoundment may in some way help protect surrounding World Heritage wilderness. The cut off low about to descend on Tassie went through us (South West WA) last night & today. Very vigorous summer system, felt like an ill wind. We got quite a bit of rain out of it, but would have gladly sent that south eastward. Glad to see that fires around Mt Eliza appear to have died down. 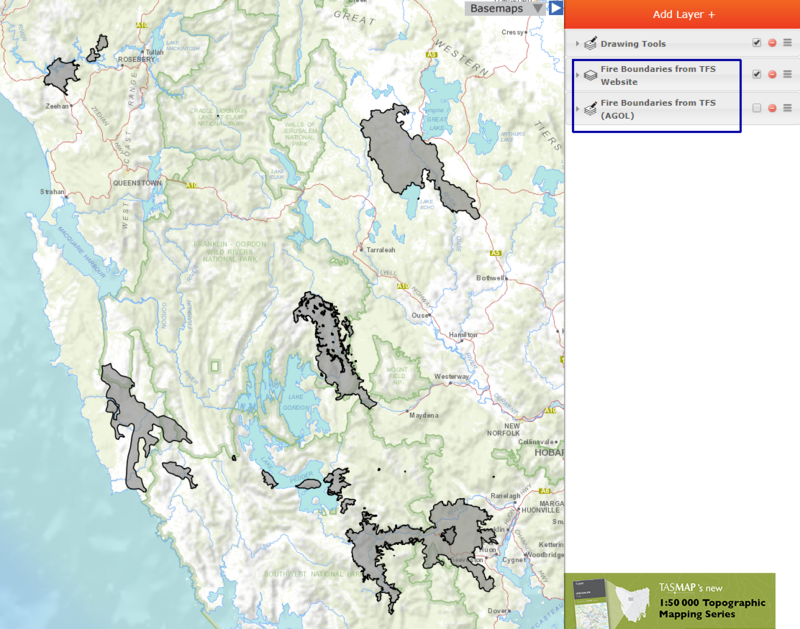 However very concerned about rapid spread of fires around Eastern Arthur’s, west of Mt Field West and Great Pine Tier. Lots of new Sentinel hotspots today. Eastern Arthurs? That's new. Oh *&%$#!, what is going to be next? Ahhhh, that's part of the Riveaux/Arve/Arthur Plaiins complex. Looks like it's about to take Piguenit and Hopetoun and trying for Bobs, with another front heading for Hartz. Blimey that thing has really taken off. So many fronts on that thing that the TFS are labelliing "uncontrollable". Moores Valley and Dolphin ridge fires look like they may join up as well. Is my understanding correct... Parks list the South Coats track as still open however the Huon Highway is closed to all south bound traffic. Are walkers potentially being flown into melaleuca but road transport is unable to go down to pick them up? Or at least vehicles are driving through areas affected by fire? They may have to wait until the fire situation eases. Only way to get specific advice on that would be to contact TasPAWS directly. Luckman’s Lead, slopes of the Boiler Plates and The Dial, and Cracroft Valley now burnt. Lucifer Ridge up to 100m from Lake Roseanne? Has spotted into the headwaters of the New River. None of which can be supported by facts. I've seen people saying that if cattle grazing hadn't been stopped (in the South West??) this wouldn't have happened, that natural forests are a hazard (actually,monoculture plantations are the biggest problem), that we should be raking the forest floor to remove fuel (yes, this one turned up here), all sorts of rubbish. Then there's the old line about "the bush burns and it will all regrow in no time". 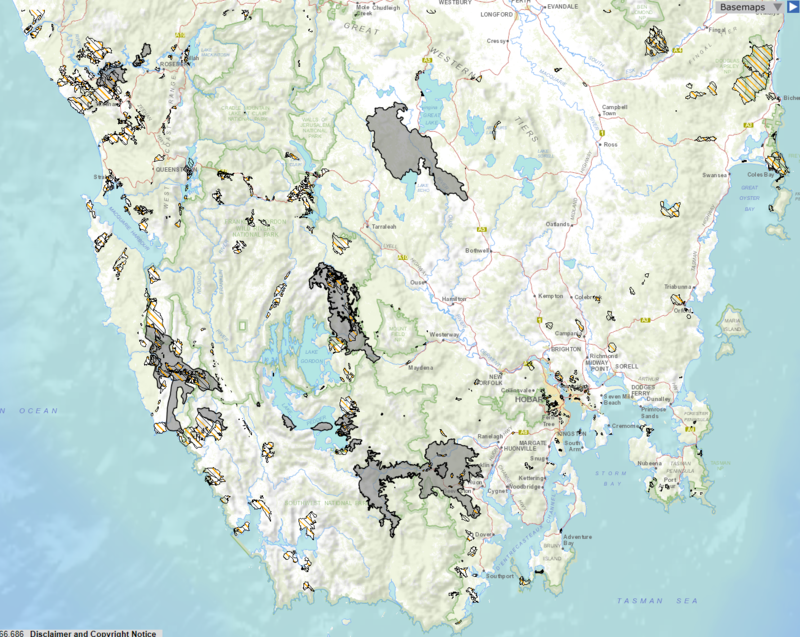 But fires like this are not normal, the alpine and Gondwanan vegetation communities are not fire-adapted, dry lightning strikes in this quantity are unheard of in Tassie . . .
We need to get the real story out, but it seems most of the MSM is ignoring it. What fuel reduction burns have occured in the areas of these current fires, in the past 3 years ? I just remembered this article from a couple of years ago, checked the TFS fire map and this site is less than a kilometer from the remote SW fires!! There's some strong opinion on fire management from 'anti-green', some strong opinion from the 'green'. I'm not finding anything much to support a strong opinion. None of the opinions are really going to matter as the impacts of climate change ramp up. We are seeing this now... no amount of hazard reduction or suppression activities will solve the problem. Hazard reduction only works on a small range of fires and suppression only works on small fires. Any mainlanders wondering what it's like - I'm on the eastern side of Frederick Henry Bay (that's the one south of the airport). I can't see further than the headland a bit over 1km away due to the smoke being blown over from the Huon fires. The smell is getting stronger, and it's not just the smell of smoke, you can smell ash and burnt vegetation as well. I'm going to need a filter to breathe through if it stays like this for much longer. Or maybe just dig my O2 deco bottle and reg out of the shed and give the lungs a nice healthy dose. Or both. We had a little rain with the electrical storm overnight (started about 2am) and a gentle shower has just started. But that's here. This morning BoM was not reporting any of that overnight rain going where it's needed, and the forecasts reckon this little break is temporary - it's business as usual tomorrow. And the fire that started recently near Murdunna is, like those up near Blessington, suspected arson. The LIST fire history of the past 5 years, is extremely light on for the current fire locations. I dare say it wouldn’t be very feasible to get in and do fuel reduction burns in some of these remote areas. Also I believe a lot of the fires (not these ones) that end up starting and getting away are from fuel reduction burns themselves jumping containment lines. You guys are pretty amazing at recognising the landscapes here. Is that the Needles on the right and Tim Shea on the left? The Sentinels and FIRMS maps show hotspots there that have crossed the Gordon River Road. There were a few if you drill in with other layers. But true, not many. Similarly some current fires have burnt to the boundary of places that have, a few, not many. You can't permalink a listmap with layers AFAIK. blakey_ wrote: You can't permalink a listmap with layers AFAIK.